The seventh single from Rev.from DVL received a December 16 release, and now we finally have some promotional video to talk about. “Vampire” starts with some standard fare Halloween sounds: orchestral chimes and theremin go a long way to pronounce the spooky. 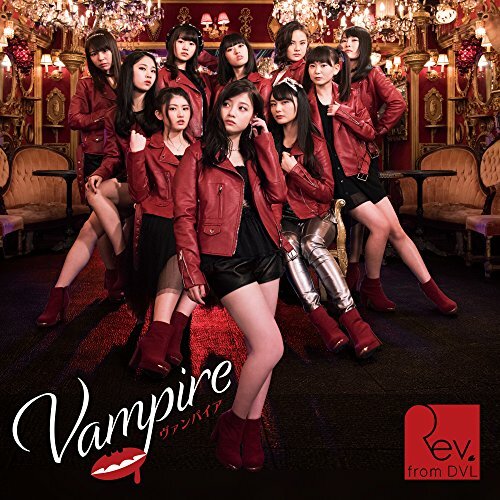 But after we get past the misaligned holiday cheer, Rev.from DVL get to the straight-up dance track of “Vampire”. Choreography for the group that features Hashimoto Kanna definitely showcases the group’s strong dance skill. The other particulars of “Vampire” feature: a great location with European appointed rooms lit orange with an abundance of chandeliers; sharp outfits with red, leather jackets; and enough Hashimoto Kanna to satisfy most of her wota. New PV Alert: Toricago – Jibun de maita no. Tane o.